If you want to try Luminar for yourself, check out these Black Friday Specials. The Luminar 2018 special runs from Nov. 21 to Nov. 28. New users can purchase Luminar 2018 for $59 plus bonuses. If you use my coupon code "SNAPSHOT" it will be $49 at checkout. Current users of Luminar 2017 can upgrade for $49 or $39 if you use my coupon code "SNAPSHOT" at checkout. Also, the new version of Luminar 2019 with digital asset management is coming on Dec. 18. and if you buy the 2018 version now you will get the update for free. 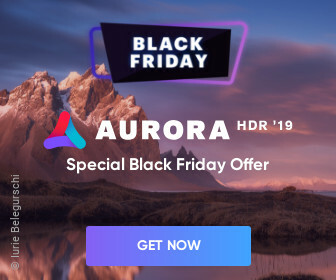 New users can purchase Aurora 2019 for $99 plus bonuses. If you use my coupon code "SNAPSHOT" it will be $89 at checkout. Current users of Aurora 2018 can upgrade for $59 or $49 if you use my coupon code "SNAPSHOT" at checkout.